For the past couple of days we’ve been back in my beloved west of Scotland, visiting a couple of National Trust properties – amongst other things. 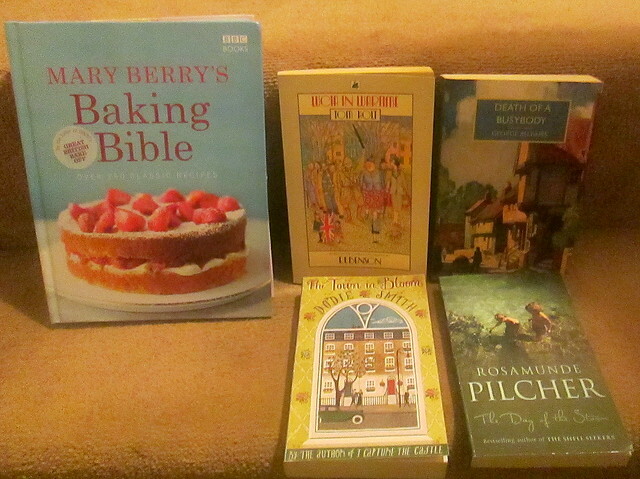 A trip to Byres Road in Glasgow’s west end is always on the itinerary and I was lucky to find four modern paperbacks and Mary Berry’s Baking Bible at some secondhand bookshops there. I now have regrets that I passed up the chance to buy a few rare old books that I thought were hideously expensive, because I now know that they were in fact absolute bargains. So annoying – but that’s life. Lots of people seem to be reading George Bellairs books at the moment but I haven’t read any yet. It’s a fair wee while since I read anything by Rosamunde Pilcher, this one is set in Cornwall, she seems to veer between Scotland and Cornwall for her settings, I like a Cornish setting – always have since way back in my Malory Towers reading days, and it’s an awful lot easier for me to go there via books than to travel the 500 miles or so from here. I like Dodie Smith although – as I recall – I Capture the Castle isn’t my favourite. Controversial? What do you think? And lastly Lucia in Wartime is of course not by E.F. Benson, but Tom Holt is quite good at writing in Benson’s style and as I adore the Mapp and Lucia books and just about any domestic fiction set in World War 2 it is right up my street, so I’m really looking forward to reading that one. In fact it has jumped straight to the top of my TBR queue, unfair on the many that have languished there – sometimes for years, but a few days back in Tilling with Mapp and Lucia is just what I need now. The recipes in the Mary Berry Baking Bible look sumptuous although with her lemon meringue pie featuring a large tin of condensed milk as part of the filling ingredients it’s fair to say that none of the recipes are for the calorie counters among us. I’m going to have to work my way very slowly through the 250 recipes in the book! 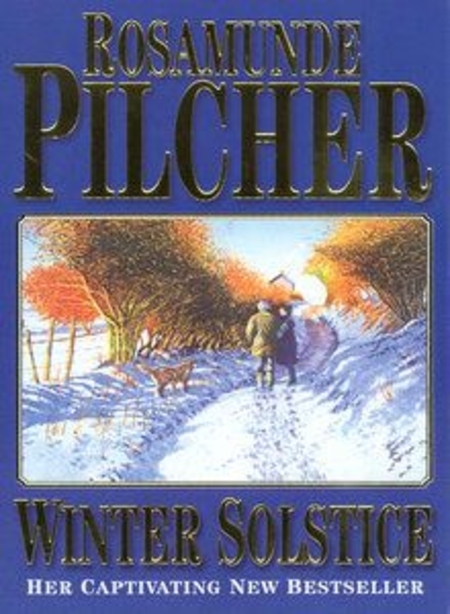 Winter Solstice by Rosamunde Pilcher was first published in 2000 and it was the last book that she wrote as she retired from writing then although she lived for for quite a few years after that. I’ve read quite a few of Rosamunde Pilcher’s books and I suppose they come under the category of comfort read, although in this one there is a tragedy, but it doesn’t involve any characters that the reader gets very involved with. Elfrida has retired and moved from London to a small cottage in Hampshire where she intends to supplement her income by making cushions and home furnishings and selling them on to a posh London shop. She makes a good job of settling into her new life and making good friends in the area, she has a gorgeous rescue dog called Horace as a companion, but there’s no doubt that the one person who is most important to Elfrida is her neighbour Oscar, but he’s already married with a young daughter. Circumstances lead to Oscar having to move back to the north of Scotland where he had been brought up and Elfrida gives up her comfortable life to join him there, and so begins a sort of tour of various houses in that area. In fact I felt that it was a bit like reading one of those glossy homes magazines. Some of the properties mentioned were definitely in need of refurbishment and others were very desireable indeed. I feel that Pilcher had decided to modernise her writing a bit for the new millenium. One of the main characters is a woman who has had a long term affair with a married man and it has come to an end. I can’t be sure, because it’s quite a while since I read any other Rosamunde Pilcher books but I don’t think she had previously had a main character who had had an affair with a married man. I think in most romances a woman like that would have been seen as a bit of a wicked witch and not the main character. In fact towards the end of this book something happens (you know me, I don’t want to say too much) and probably a lot of people would think that it is just too unlikely but – hold on to your hats girls – some husbands/widowers DO replace their wives after only a couple of months of their death, well they do in Kirkcaldy anyway. I know, I have said too much! Anyway, Winter Solstice is an enjoyable jaunt from Hampshire via London and on up to the wilds of Creagan which is north of Inverness in the Highlands of Scotland, and you can go on a tour of the places mentioned in the book, have a look here if you’re interested. There’s romance a-plenty too. You can see some images of Creagan here. I knew that the author Rosamunde Pilcher lived near Dundee but i hadn’t realised that it was actually Invergowrie that she had her home built. It’s up for sale now and if you’re interested you should have a look at the link below, her house is gorgeous. As you can see it has an outdoor swimming pool, Rosamunde must have been a hardy soul, although the sea in Cornwall where she grew up must have been freezing cold too. I don’t blame her for settling in Invergowrie, it is a beautiful area and happens to be where my youngest son works. Changing subject completely, I was surprised to read the obituary of Madame Carven in today’s Guardian. I had no idea that she was still alive, she was 105. I didn’t really know anything about her fashion designs but as a person who really doesn’t like heavy perfumes – in fact I always hold my breath when going through the perfume department in any stores, otherwise I’m in real danger of having a three day long migraine triggered off by the ghastly pongs – Madame Carven’s Ma Griffe was the only one which I’ve ever loved and I had no ill effects with it, I’m not even sure if it’s still available as I haven’t seen it for years. Rosamunde Pilcher – her 90th birthday. I’ve been enjoying reading Rosamunde Pilcher’s books for a few years now, not nearly as long as my childhood penpal has been. Rosamunde Pilcher’s books are amazingly popular in Germany. I so wish that I could visit Bude in Cornwall to attend the celebrations to mark her 90th birthday, but as we have just returned from holiday it’s just not possible, Cornwall is a long way from Fife. If you live within easier striking distance you might want to hop along to Bude and take part in the celebrations. Debbie Cousins has written to me about a couple of events to celebrate Rosamunde Pilcher’s 90th birthday and 25th anniversary since the publication of The Shell Seekers. We are hosting an art Exhibition in Bude, inviting Cornish Artists to participate by submitting their work inspired by “The Shell Seekers”. The event will be from 11 Sep-4 Oct 2014 in Bude, there is also a food festival planned over weekend of 19-21 Sep. We have a limited number of signed novels available. Two special events in Bude, Cornwall have been planned to celebrate author Rosamunde Pilcher’s 90th birthday. The author’s novels are mainly based in Cornwall and filmed adaptions attract flocks of tourists, particularly German, every year. Rosamunde Pilcher’s birthday, in September, will also mark more than 25 years since the release of one of her most famous works “The Shell Seekers” – the story of a family heirloom painting. and an inaugural Bude For Food festival, showcasing the very best food, drink, hospitality and restaurants Bude and the surrounding area has to offer, from 19-21 September 2014, also at The Castle grounds. Visitors will also have the opportunity to purchase the original art from the exhibition. The Shell Seekers was published in 1987 and is a semi-autobiographical novel revealing life from the Second World War to the 1980’s. Following the life story of Penelope Keeling it examines her relationships with her parents, husband, her three children and lost loves, with resounding honesty. “The Shell Seekers” is a painting bestowed on Penelope as a wedding present from her father, a famous painter. Penelope has a dilemma of what to do with the painting, as her father’s works have become very valuable. Cornish Artists who would like to take part in the artists’ exhibition should get in contact with Lynne Holehouse, at Seventh Wave Gallery in Bude, or for the Bude For Food Festival please contact Richard and Fionagh Harding from Cornish Charcuterie. Visitors will be able to keep up to date with these events through www.TheShellSeekers.co.uk website. German tourists come to Cornwall thanks to ZDF, a Germany TV production company who has produced more than 100 of Rosamunde Pilcher’s stories for TV and are set and filmed primarily in Cornwall. These programmes have become a Sunday TV institution for German families. Voices in Summer was first published in 1984, which seems like yesterday to me but I had to remind myself that it is actually 30 years ago – amazingly. A few times in the book there is reference to a character looking for a telephone box to call someone and things like that really date it. I don’t know about you but any mention of a phone box and I can smell one, not a pleasant memory I’m sure you’ll agree. I can imagine that some younger people will be reading Pilcher’s books for the charmingly nostalgic atmosphere, the way my generation reads books like Angela Thirkell’s, harking back to a gentler society – even in wartime! Voices in Summer is set in Cornwall, which is where the author was born and grew up but she married a Scot and after that she lived in the Dundee area I believe. She certainly lived most of her life in Scotland and is generally regarded as a Scottish author. This one is a light read, good for beach reading or when you’re travelling and don’t want to concentrate on much. It’s a bit of a romance with some mystery thrown in for good measure. Laura is recently married, to Alec a well off businessman, and their story begins in London where they live. Laura is Alec’s second wife and she feels the presence of her predecessor hanging heavily in the house. Not that the first wife is dead, but she ran off with a younger man and poor Laura is having to live in her house with her choice of furniture and has even inherited the first wife’s friends. I saw shadows of Daphne du Maurier’s Rebecca in this one, there are quite a few similarities, not that it comes up to the standard of Rebecca. I’m the sort of reader who enjoys a lot of description in books, especially of landscapes but I do feel that Pilcher takes it all just a wee bit too far and she leaves nothing to the imagination. It’s almost as if she is writing in the stage directions too. I mention that because I think that there are times when there are just too many words and it all gets in the way of the storyline and I just want to say to her — och get on with the tale! Never happy – I hear you say. Or pernickety besom! Of course this is another one which I read for the Read Scotland 2014 Challenge. Agatha Raisin and Something Borrowed, Someone Dead was published in 2013 and was a last second choice as I was about to leave my local library. I had previously decided not to read any more in this series as I had decided that it had definitely come to the end of the line. I should have stuck to my guns about that as this one was just the same old Agatha stuff, including her ‘excellent legs’. Remind me not to read any more, please! Sleeping Tiger by Rosamunde Pilcher is a very quick and light read, not in the same class as The Shell Seekers or September but it’s a mildly diverting romance set on a Spanish island where Selina has gone in search of her father. I read this one as part of the Scotland 2014 challenge. … and last but not least Crime Stories from The Strand which is a lovely Folio book of short stories by crime writers such as Conan Doyle, G.K. Chesterton, A.E.W. Mason and many more. I was especially chuffed to get the four Thirkells, three of which I bought from a stall in Cambridge market, her books don’t often turn up in Scotland for some reason, strange really as she’s at least half Scottish. I’m hoping to have sorted through some photos from our trip by tomorrow. 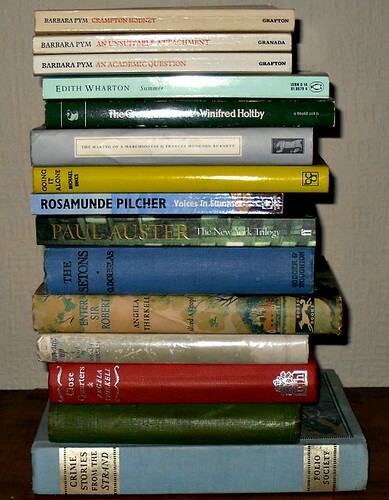 I was about 20 or 25 years behind everybody else where reading Rosamunde Pilcher is concerned as it was only last year when I got around to reading anything by her. If you’ve read her book September you might remember that the story is set in Scotland and the main characters are Lord and Lady Balmerino. At the time I thought that it was a made up name but since Duncan (eldest son) moved to Dundee we’ve been driving past a road sign which points the way to Balmerino Abbey and last Saturday we got around to visiting it. The photo below is the view on the way to the abbey. It actually looks far more beautiful in real life, there aren’t many parts of Fife which are very scenic but this area in the north of Fife is not bad. 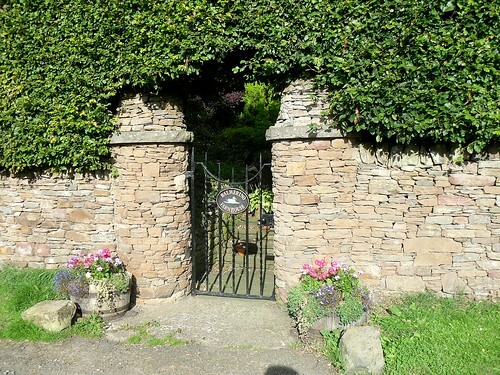 I loved this gateway, it’s all dry stone walling, no mortar involved and this is one of the best I’ve ever seen. 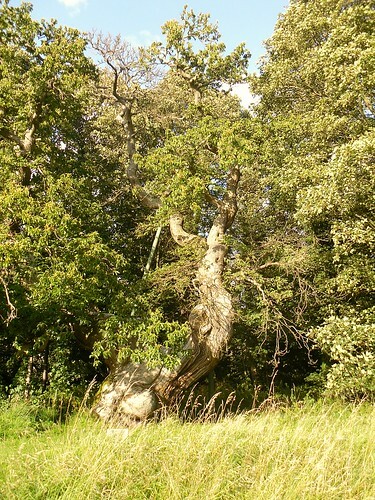 This Spanish chestnut tree is in the grounds of the ruined Balmerino Abbey. It has been tested and apparently it’s between 400 and 435 years old. You can see that some of the branches are being supported by massive metal poles, in the same way that the Birnam oaks are. 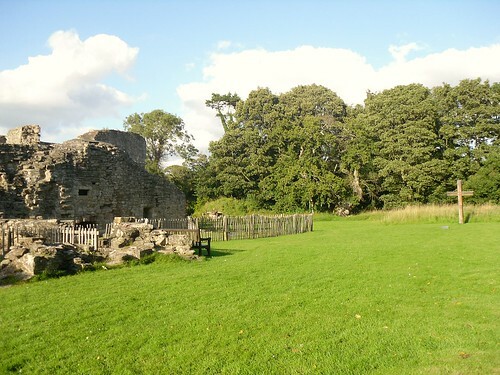 On the left of this photo is part of the chapter house of the abbey and the huge cross is where the original altar was. Ermengarde de Beaumont founded the abbey and she is buried in front of the cross. If you’re in the area it’s definitely worth a visit, Balmerino itself is very small but in a lovely setting by the banks of the Tay. It’s very remote though and you have to get into a car for the necessities of life as there are no shops, it would be about an eight mile round trip to buy a newspaper! You might know that I’ve been avoiding buying books recently, mainly because I’ve got so many unread books in my house. But last week I bought a few in Edinburgh and that sort of opened the floodgates. As it was a lovely day today we took ourselves off to St Andrews and ended up (well actually we began) in the bookshops. This lot is the result. The book gods must have been hovering above me today. Only one Virago mind you but what a one, I love Elizabeth von Arnim. There weren’t any books by the authors that I was actually looking for, except for The Braddons by Angela Thirkell but I requested that one from the library so there wasn’t any point in buying it. It’s just as well that I’ve got more time for reading now that we don’t have a house full of boys any more. On to Dundee to try out Duncan’s local fish and chip shop which was very good. Then we had coffee towers from Fisher and Donaldson – so bang went the healthy diet. And bang went another Saturday too. Well, if you’re going to fall off the wagon you might as well do it in style.